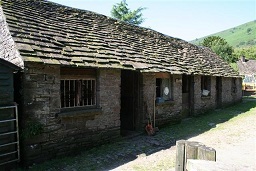 Over the past few years Sue has had a dream of turning these stables into a rustic tea room and bed and breakfast accomodation catering to the needs of people visiting, walking, trekking and camping within the Llanthony area. This dream has finally come true for Sue who now has a traditional stone barn and stables that has been sympathetically restored, with the original stone tiled roof being stripped, given new timbers and then the stone tiles returned to take pride of place. A few old pictures with our horses in the stables before we started work, click on the pictures to see them better. Now look at what we have done with the old stables.